Teruhiko Wakayama engaged in research on reproduction technology of mammals, devised a clone animal producing method directly injecting somatic nuclei into ova, and produced a clone individual of mouse for the first time. Furthermore, adding various ideas, he has conducted technology development establishing embryonic stem cells from somatic cell via nuclear transfer. Thereby, he also succeeded in production of offspring from advanced age infertility, production of clone individuals from a long-term frozen body, and production of offspring from freeze-dried sperms. 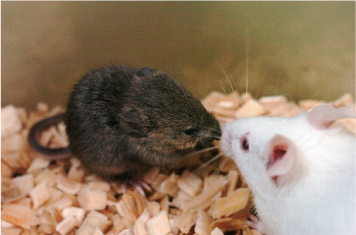 Almost all the cloned mice in the world are produced by the method developed Wakayama at present. Thus, Wakayama established the basic technology of animal reproduction, which is greatly expected for contribution to development of the livestock industries, such as gene resource conservation and production of excellent livestock. Therefore, Wakayama shall be awarded the 10th Yamazaki-Teiichi Prize in Biological Science & Technology. Invention of the artificial insemination technology (method to obtain offspring without mating) which may be the origin of animal biotechnology has dramatically improved the productivity of livestock which depended on natural mating before, and now, almost all of the cows are born by artificial insemination. However, there is no remarkable progress in half century, a new technology enabling mass production of excellent livestock was needed to revive the sluggish livestock industry. For basic research, there was development of a micromanipulator enabling fine movement under a microscope, micro-insemination technology for fertilizing by injecting sperm directly into an ovum and the world's first somatic cell clone of sheep were reported, it was considered that these technologies would be able to mass-produce excellent livestock more efficiently than artificial insemination, and could greatly improve the livestock industry. However, the success rate was very low, in addition, technology acquisition was difficult, and its practical application was not sure. Wakayama succeeded in cloning of mice for the first time which was impossible by the conventional technology. Almost all researchers use this method to produce clone mice at present. Succeeds in establishing embryonic stem cells (called nuclear transfer embryonic stem cells) from cloned embryos made by nuclear transplantation of somatic cells, he proved that it is possible to produce own embryonic stem cells for the first time. Actually, in research using a Parkinson's disease mouse, making nuclear transfer embryonic stem cells from the somatic cells of the tail, making them differentiate into a nerve, and transplanting them in the brain of the original mouse, he succeeded in model experiment of regeneration medicine to treat itself for the first time. On the other hand, an ethical issue that donation of an ovum may be needed for cloning technology may occur, however, he demonstrated that the issue of offering an ovum could be settled by using the ovum which failed in in vitro fertilization in infertility treatment. He succeeded in producing a clone individual from a frozen mouse body at -20 ℃ for 16 years. This result proves that a life can be revitalized regardless of dead or alive cell for the first time as long as the nuclear genetic information has not broken, indicating the possibility of revival of extinct animals which used to be considered to be a science fiction for the first time. For infertility treatment, a treatment technique using immature reproductive cells was developed. However, when the reproductive cells are lost completely, it was impossible to produce siblings before. So, producing nuclear transfer embryonic stem cells from the somatic cells of a completely infertile mutant mouse and letting them differentiate into reproductive cells in combination with chimera technology, he succeeded in producing many offspring for the first time. He succeeded in production of offspring even from a completely infertile old mouse in a similar way. The results indicate not only that the method can obtain siblings even from an individual lacking reproductive cells but that the gene resource of the original individual can be maintained as nuclear transfer embryonic stem cells. In mammals, he succeeded in obtaining offspring using freeze-dry sperm stored at room temperature for the first time. This technology has enabled storage of sperm at a room temperature, which could be stored only in liquid nitrogen before, attracting attention as an epoch-making method capable of reducing the cost of storage or management significantly. Unlike sperms, ova are produced in only small amounts. However, Wakayama succeeded in producing ova by nuclear transplantation of the cells called polar bodies discarded when ova are produced. Since this technology can increase one ova four times, it is considered to be effective when ova are too few for infertility treatment. This method has enabled not only mouse somatic cell clone considered impossible before but also quicker and more experiments than the conventional method. Now that mice of a small laboratory animal can be used for basic research, with improvement of the success rate and advancement of research on abnormality causes of clone animals, it can be expected application to mass production of excellent livestock in the future. On the other hand, extinct animals such as mammoths unearthed from the permafrost and stuffed Japanese wolves may be able to be revived by the nuclear transplantation technology in the near future. If the extinct animals lost in the past can be revitalized, besides bringing children a dream, discovery of valuable gene resources such as disease resistant or cold-resistant genes can be expected. The room temperature storage method of sperms by freeze-dry is also considered to greatly contribute to gene resource conservation. In conventional liquid nitrogen storage, handling and management are hard because of ultra low temperature, and the liquid nitrogen has to be continuously supplied because of spontaneous evaporation. On the contrary, in the freeze-dry method enabling room temperature storage of sperms, the maintenance cost of liquid nitrogen is unnecessary, and management is also easy because of room temperature. In addition, domestic and international transportation can be performed at a low cost because of the unnecessary of refrigeration systems. Depending on improvement in the future, it is likely to be a new storage means completely replacing the conventional method.